I'm looking around, but I can't find anything quite adequate. 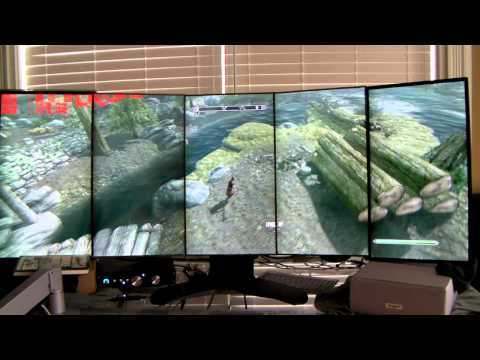 What I want is a massive display, preferably at least 40" diagonal, with high resolution. 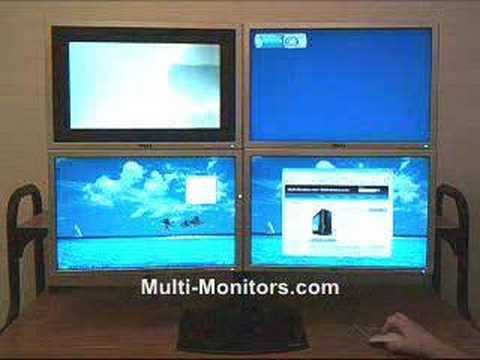 Sure, I could just get a couple of 27" displays, but I'd prefer a single, massive display. If any of you out there know of such a device, I'd love to know. Not high enough resolution -- 4x HD would be great, but I'll settle for less. Thanks, though. I have a Samsung 40" LED TV. It's pretty great, but I want something more suited to the 50cm working distance typical of computer work. I'm starting to consider different possibilities, now that I still can't find anything quite ideal. Alternatively, a vertical 2-display stand might work, loaded with 27" displays. I'd like to see one in action, though, or hear some testimonials about the ergonomics. Hey Marvin: thanks for the advice. I don't really like breaks in the display, as caused by multi-monitor rigs, which is why the optimal solution is just a single, huge monitor. One of my friends has an 8 x 20" rig, and I don't really find that it improves ergonomics. I'm thinking about maybe having an upper display used for storing ancillary apps & windows, and a lower display for main working, both 27" displays with thin bezels, if possible. Maybe I can even un-package them to reduce bezel width. Re the Toshiba display.... Let's just say it's not completely out of the realm of possibilities.